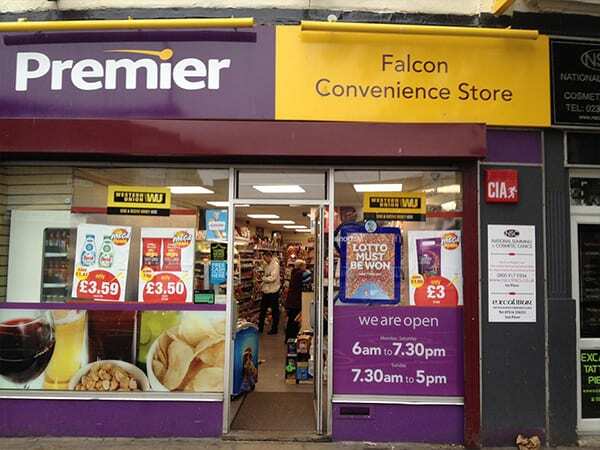 Premier Stores are a brand of local newsagent stores owned by independent retailers throughout the UK. With over 3,000 stores they are one of the UK’s leading convenience store companies. Bob Sood is the proprietor of one of these stores and came to one of our partners in September 2018. 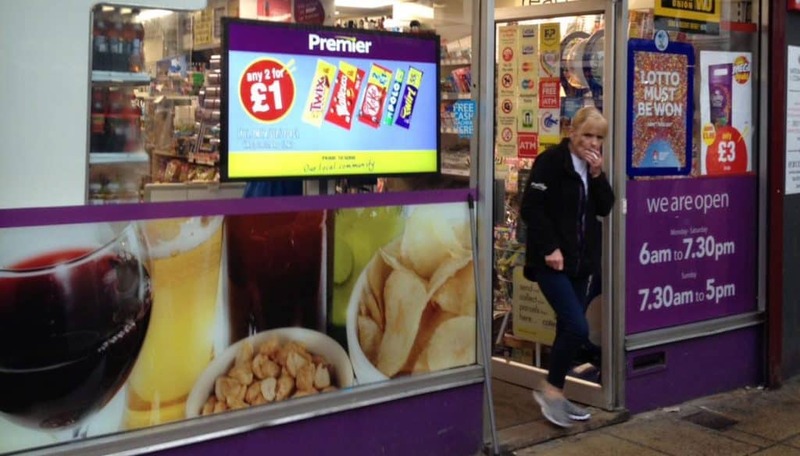 ‘Falcon News’, a Premier Stores branch in Portsmouth, were looking for a Digital Signage display for their store window. They wanted a Digital Signage display to promote deals and offers that can be found in store. The current print signage looked cluttered and unfocussed reflecting poorly on the store. 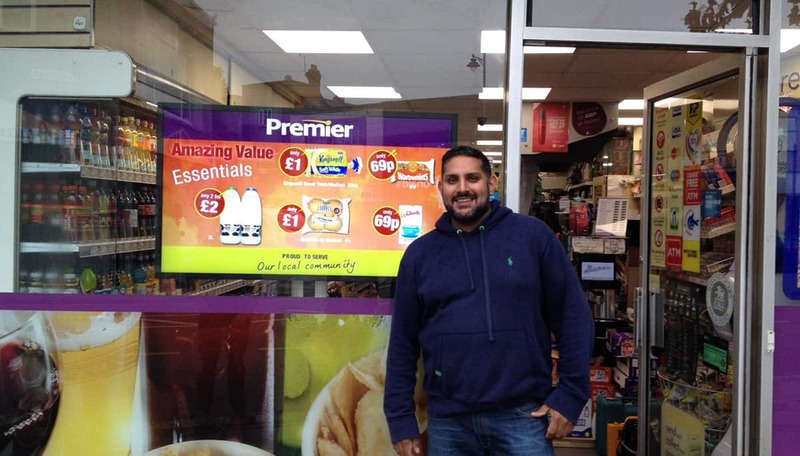 Mr Sood is a member of the Federation of Independent Retailers (NFRN) and this project was to be the first in a trial with integrating Digital Signage in independent retail stores, if this project went well there could be massive potential among the other 15,000 stores of the NFRN so the pressure was on to do well. ‘Falcon News’ wanted our partner to supply and install the Digital Signage solution as well as to create and manage the content. With the display being in a window Mr Sood knew that the screen would need to have a higher brightness than normal commercial displays to counteract the natural daylight. Falcon had a realistic budget in place for a commercial grade solution but wanted it to be as cost effective as possible. Ease of installing the display was also a priority for the store. The store could not close while the screen was being installed with as minimal disruption as possible. There was also a large drinks refrigerator in the vicinity of where the screen was to be mounted that had to be taken into consideration. With a tight deadline set a quick turnaround was needed for this project. Based on the set budget we recommended a 49” High Brightness Monitor. As the store window is north facing, we felt confident that the 1,500cd/m2 brightness would be sufficient for this application. The High Brightness Monitor is the most cost-effective solution for a window display of this size. As the screen was going to be externally managed the screen would have to be networked to allow for remote updates and management. To make the installation as easy as possible we supplied a Tilting Floor Stand that could be positioned around the large drinks refrigerator with minimal fuss. As we hold a significant volume of stock here in the UK we could easily accommodate the tight deadlines for the project and delivered the screen on time. The screen was delivered on time for the installation to proceed smoothly in early October of 2018. With the High Brightness Monitor in the window Mr Sood was able to showcase a variety of deals and promotions to passers-by. The bright display was certainly more eye catching than the muted printed signs that inhabited the window before. Mr Sood was expectedly delighted with the solution that was provided as seen in the picture below. With the success of this first store there is a lot more potential among the NFRN and other independent retailers for our partner.